A festive and cheerful way to ring in the new year! These cupcakes are made using our gold 3mm gold and 5mm gold dragees, sugar champagne bottles and gold and chocolate high tea muffin cups. You can affix the dragees (the “bubbles”) to the sugar champagne bottles in advance using edible clear gel. Let them dry before trying to stick into your cupcakes. These make for a great presentation for any new year’s gathering – a wonderful way to add some cheer to 2010! Happy New Year! All products available at fancyflours.com. 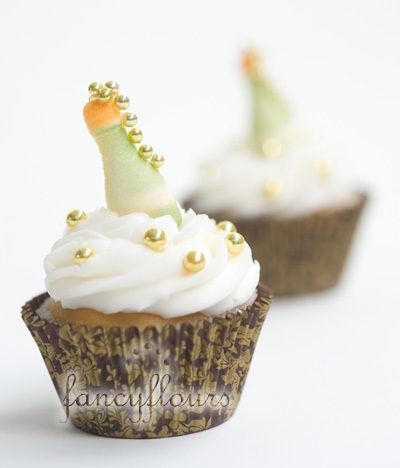 This entry was posted in Cupcake Recipes & Ideas, Winter Baking and tagged champagne, cupcakes, dragees, fancy flours, fancyflours, new year by Fancy Flours. Bookmark the permalink. What a creative idea!!! I loev them!